Egypt's President Abdel-Fattah El-Sisi urged the government on Saturday to push ahead with the country’s economic reform programme, Initial Public Offerings (IPO) of government-owned companies, as well as increasing public expenditures on education, health, and infrastructure in the state budget for 2018/19. 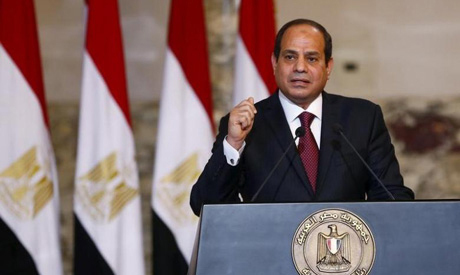 El-Sisi made the comments during a meeting with Prime Minister Sherif Ismail, Minister of Finance Amr El-Garhy and other top governmental officials, according to a statement by presidency spokesperson Bassam Rady. The meeting highlighted the initial features of the 2018/19 state budget, which targets a surplus of 2 percent of the GDP and a decrease in the budget deficit to 8.5 percent of the GDP. Initial estimates point to a 20 percent annual growth of state revenues and 13.6 percent annual growth in state expenditures. The meeting also reviewed the IPO programme that is set to be implemented during the coming two years, which will offer shares in dozens of state-owned companies over the next three to five years in areas including oil, public services, chemicals, shipping and real estate. El-Sisi urged the government officials to continue with efforts to ensure the success of the IPO programme in order to attract more investments and provide financing for both the companies and the budget. Since 2016, Egypt has been pushing ahead with a series of austerity measures, including fuel and electricity subsidy cuts, to help ease the country's gaping budget deficit. El-Sisi also reviewed the state budget of fiscal year 2017/18, where the total budget deficit decreased to 9.5-9.7 percent of GDP, compared to 9-10 percent the year before. An initial surplus has also been achieved for the first time in 10 years, and the public debt is set to decrease to 97 percent of GDP due to financial setting efforts, economic reforms, the recovery of economic activities, and the increase of the confidence of investors, the statement said. Fiscal year 2017/18 has witnessed an improvement in the public expenditure structure, given the increase in social protection and investment in the public sector, the minister of finance said during the meeting. Rady added that there have been other improvements in the government’s balance of payments, balance of trade, as well as the increase in foreign currency reserves. According to the 2014 constitution, the country's new budget and development plan should go into effect on the first of July every year, following parliament approval.